With the Base Model, order only the detail plates you need engraved; add additional plates as you need them and screw onto a template on the sides of the base. Our Nickel Plated Georgian Cup is a beautiful metal cup mounted on a wood base. 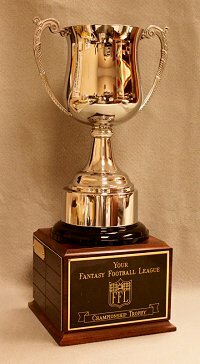 The large model can be mounted on a traveling base with up to 24 detail plates, to record your champion each year. Many people have asked us for a cup that they can pour a beverage into and drink from - this is it! The Base Model comes with templates for mounting detail plates on the sides adjacent to the title plate. There are slots for up to 16 plates included. Only the plates you have engraved will be included and mounted. Leagues on a tight budget only pay for detail plates as they have them engraved with this option. 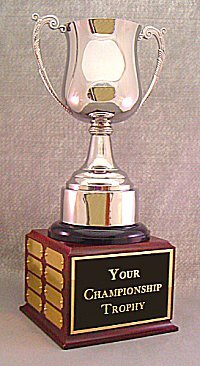 You may elect to acquire a template for the back side, if you wish, to make the award good for 24 years' worth of champions. The Deluxe Model has the elegant traditional look of a perpetual trophy, as it comes with 24 detail plates premounted on the base. You may have your plates engraved locally, or you can order a new plate from us when it is time to add your next champion. The 0 Detail Plate Model comes with only a title plate on the base; it has no detail plates premounted on the sides, nor does it have a template for mounting detail plates later. 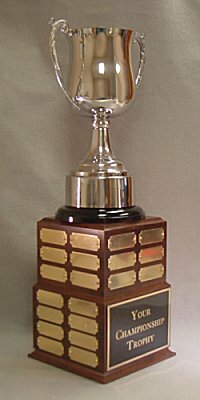 This allows this award to be used as a keeper award, or an inexpensive traveling award. If you use it as a traveling award, you can add templates to the sides later to make it a perpetual award. If you may require more than 24 detail plates, you may want to consider our Travel Base Extension. Click on any image to see a larger picture of this award.